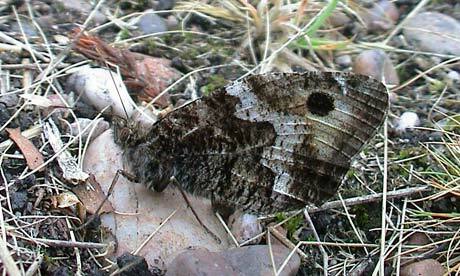 Special features: The grayling is the largest brown butterfly in the UK. There are two black eye spots on each forewing which can be seen on the upper and lower surfaces. The spots have a white dot in the centre. The males have a dark brown border on the leading edge of the forewings. This releases a scent during courtship. Although the photo above doesn't show the pattern on the upper wings, this is the view most people get of the grayling. It rests on the ground, retracts its forewings, and even tilts over on its side to minimise its shadow. Distribution: Found mainly around the coastal counties of the UK. Months seen: June to October. Habitat: Coastal grassland and sand dunes. 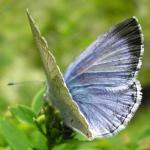 Food: The adult butterflies drink tree sap. The caterpillars feed on various grasses including marram grass and sheep's fescue.